This page contains a pictorial report of the BBC campaign. For the first results you can have a look in our database. 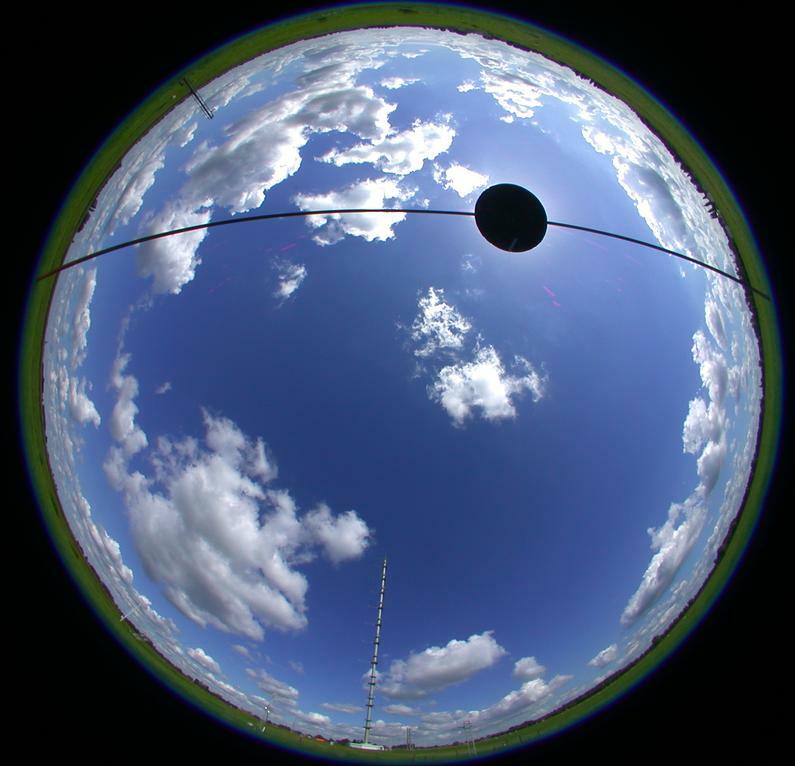 The BBC campaign is a joint cloud measurement campaign of the CLIWA-NET and the 4D-clouds project, with many individual contributions of other universities and research institutes. 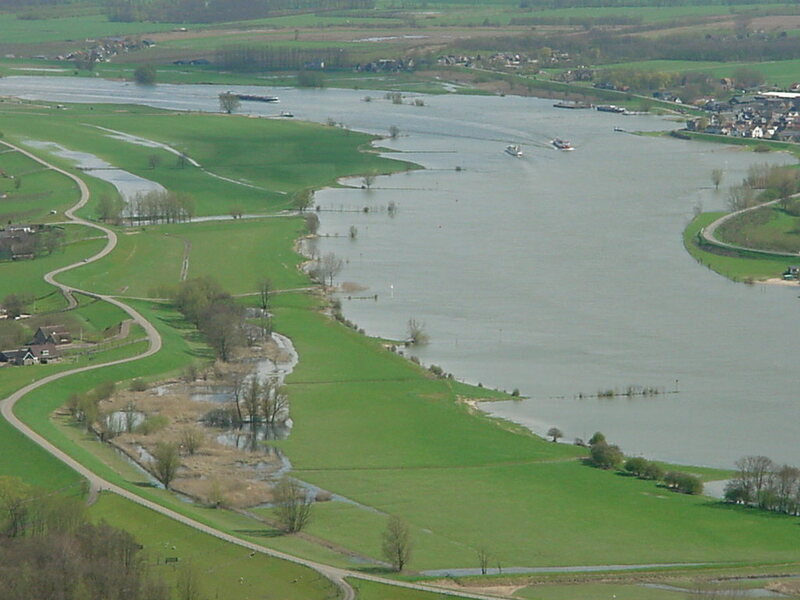 CLIWA-NET is a european project on water cloud properties on continental and regional scales. In two previous campaigns CLIWA-NET has measured cloud properties in the region around the BALTIC sea. 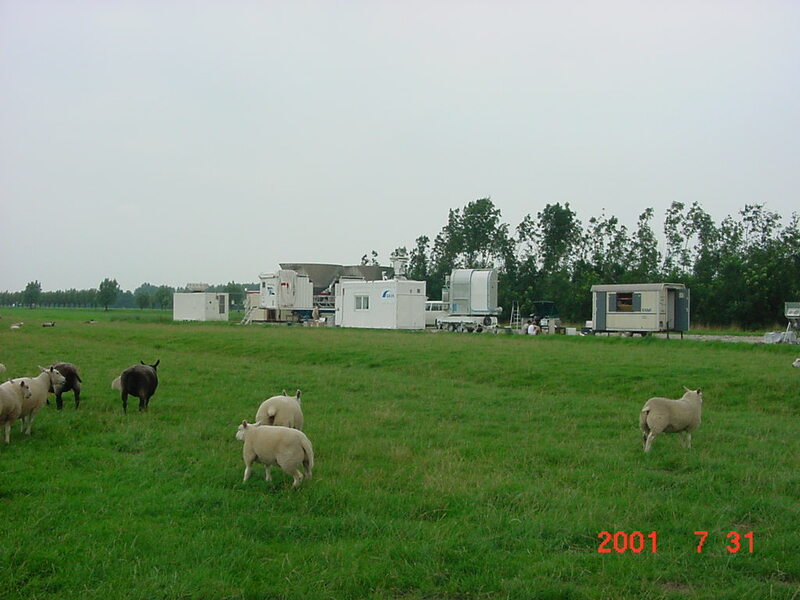 The 4D-clouds project is a german project on the three dimensional cloud structure and its influence on the flows solar and heat radiation. For more background information on the 4D-clouds part of the BBC campaign there is a press report in german. 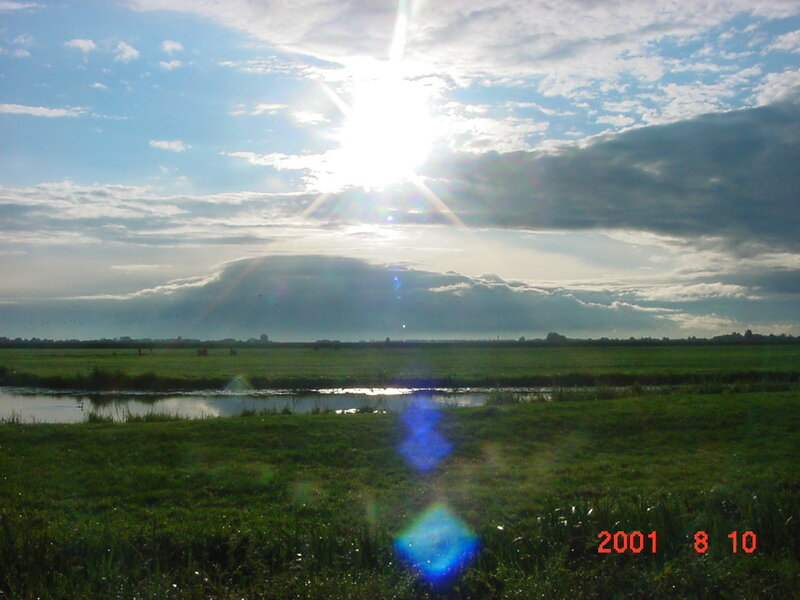 In english you can find much more scientific background information on the 4D-clouds website. Most pictures were taken in august, the first month of the BBC campaign. Not all instruments were installed yet. The three airplanes will fly in september. 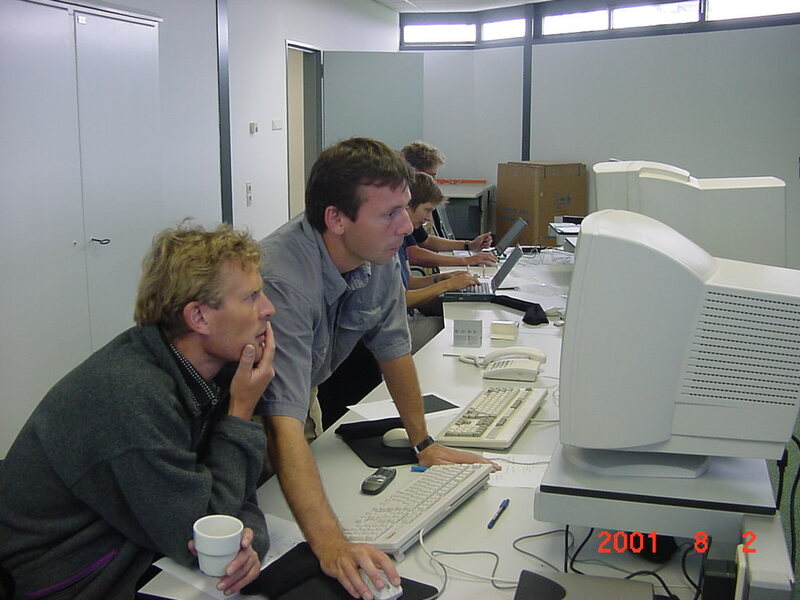 All the pictures with a red date were taken by Wim Hovius, technical project coordinator and supervisor Cabauw KNMI. Other pictures belong to their respective institutes. Clicking on the image will give you a version with better resolution. The most striking feature of the Cabauw site is the meteorological measurement mast of 213 m, which was build in 1972 for boundary layer studies. 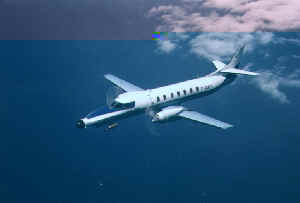 In this picture one can clearly see that the plane parallel approximation of clouds in not always valid. 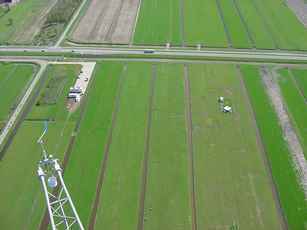 If you look from the mast to the west, you will see the remote sensing site (left on the picture) and the RASS (right). 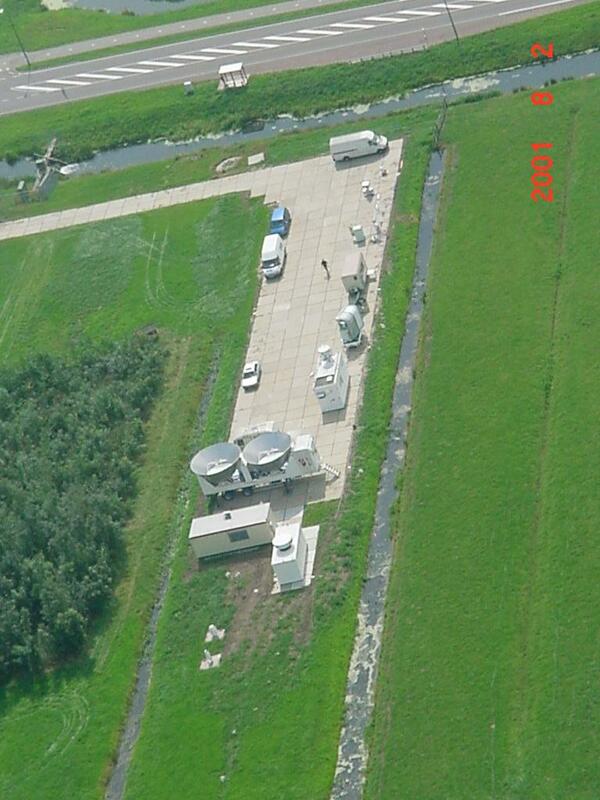 A closer look on the remote sensing site, where all the microwave radiometers, lidar and radar are located together. The remote sensing site at ground level. 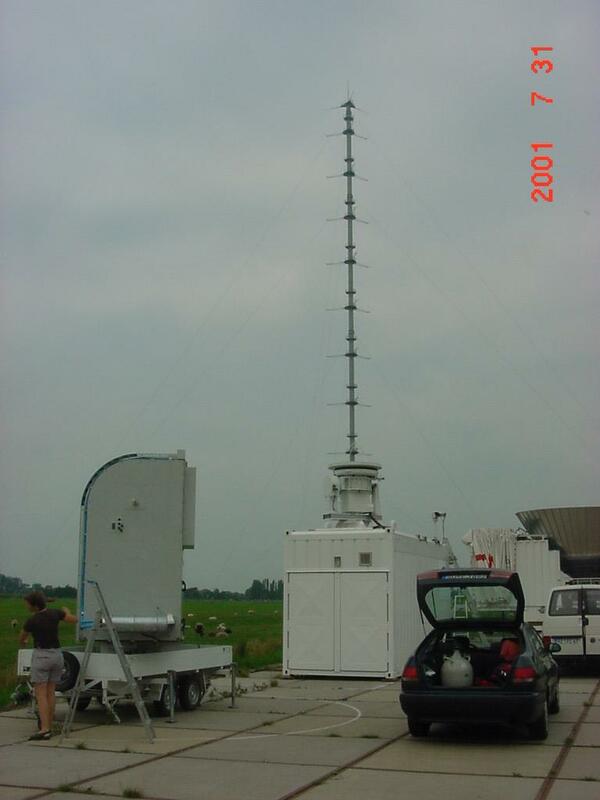 At the left are the three radars from KNMI (8 mm), Delft University (9 cm) and GKKS (2 mm). 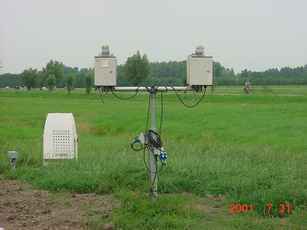 At the right are the microwave radiometers. 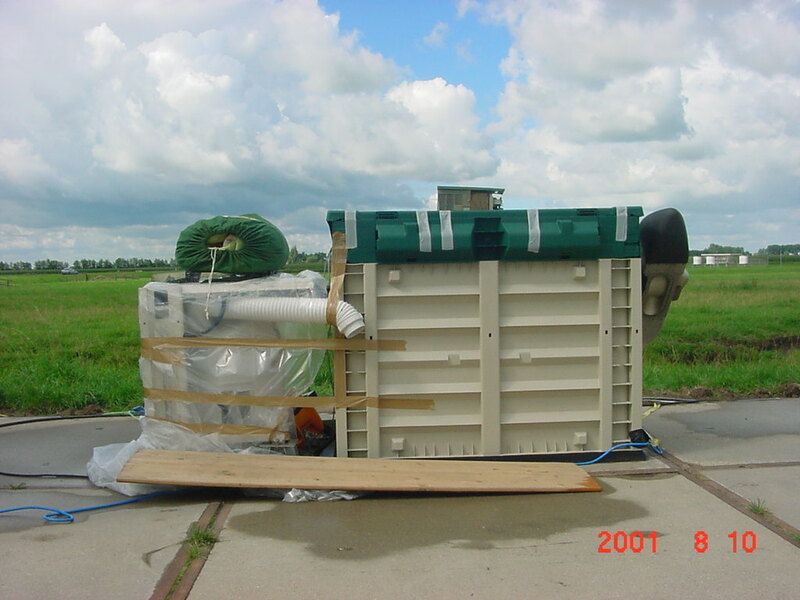 A 3-dimensional wind measurement by the university of Wageningen, The Netherlands. A balloon for boundary layer measurements from the IMAU, University of Utrecht, The Netherlands. With this balloon measurements of humidity and temperature can be made up to 1 km. There are much more balloon pictures. 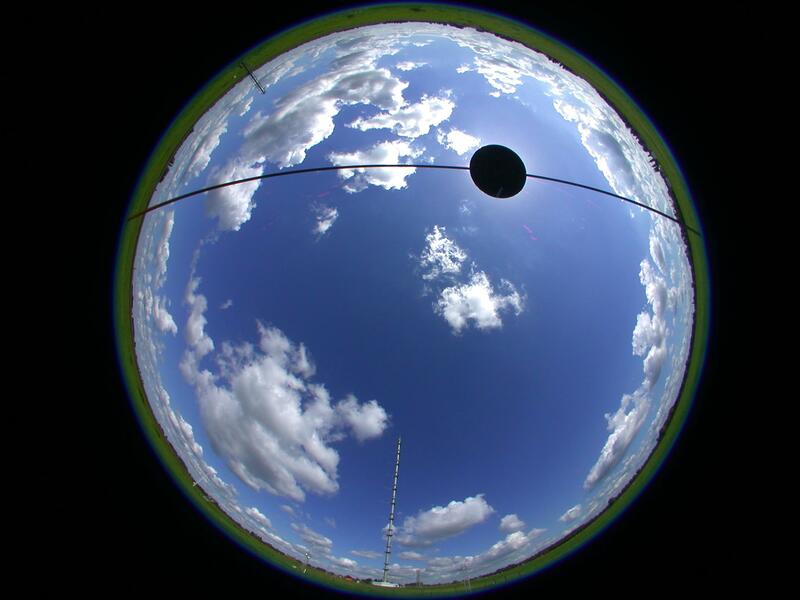 In august also a balloon from the IfT, Leipzig, Germany, will be in Cabauw, which will carry instruments to measure the properties of the cloud droplets. 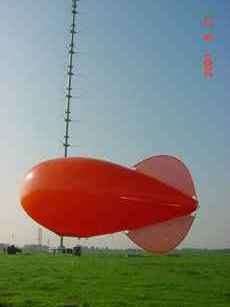 As these balloon move vertically (in contrast to airplanes) they can measure vertical profiles, which are very well suited for validation of the remote sensing instruments. 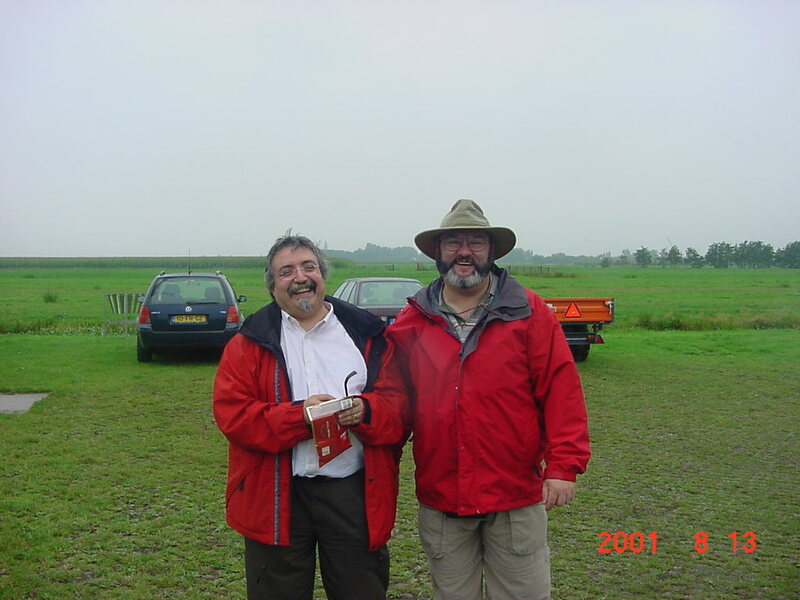 In august also the three airplanes of the BBC experiment will start flying. 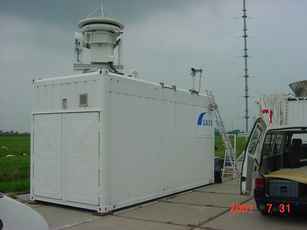 This is the Merlin of Meteo France, which will make measurements of the microphysical cloud properties, i.e. the amount of cloud water and droplet sizes. 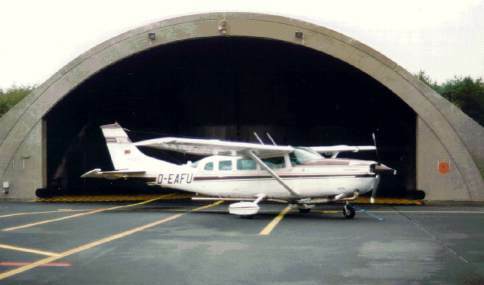 This is the Cessna airplane that is used by the University of Berlin for measurements of solar and heat radiation. 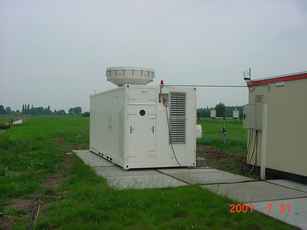 Special about these measurements is that the platform of the instruments is stabilized so that little errors are made in estimating the upward and downward radiative fluxes. Next to these two airplane also the IfT, Leipzig will fly the Partenavia, which is equipped with instruments to measure aerosol properties and radiation. As part of the CLIWA-NET project, 8 radiometers make measurements. They were only at Cabauw for the first two weeks of august, and were spread over the Netherlands for the rest of the BBC campaign. 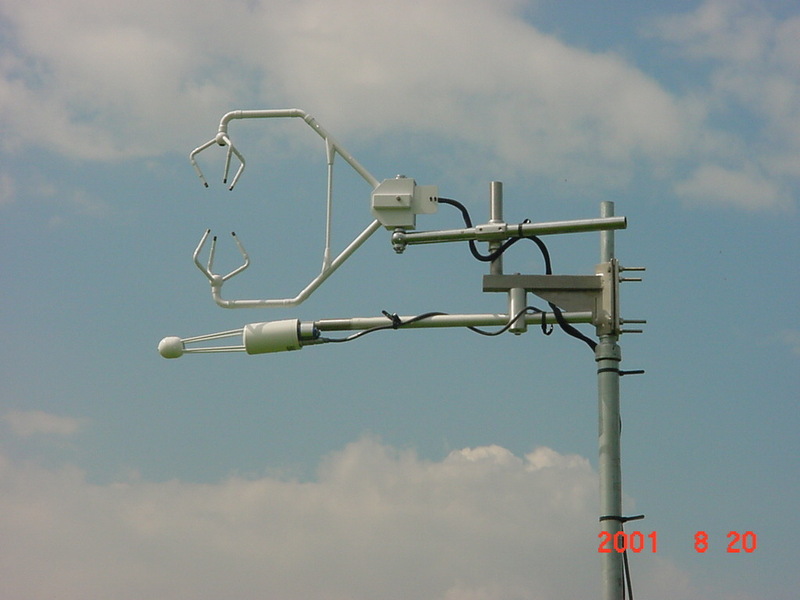 Only the MICCY radiometer remains in Cabauw. 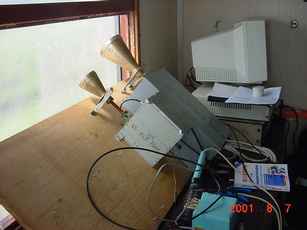 This is the radiometer of the Chalmers University, Sweden. 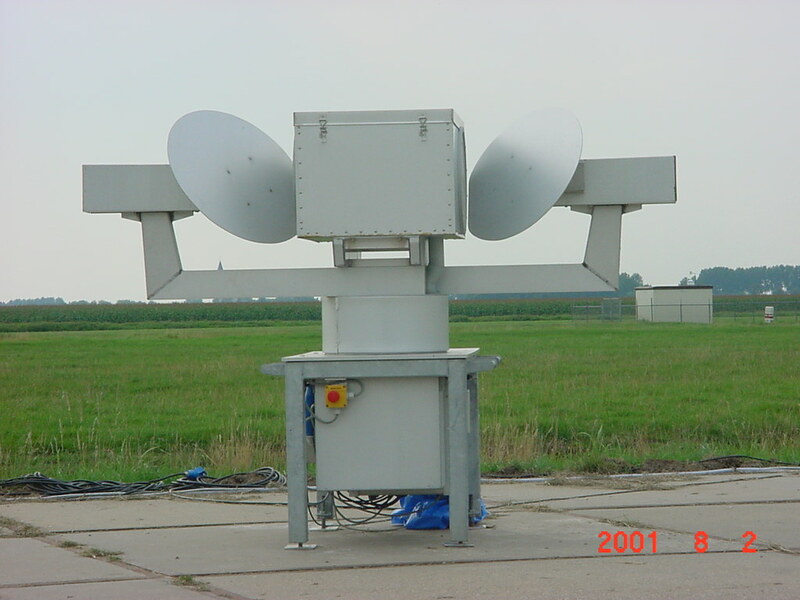 The funny flaps at both side are rotatable mirrors to make scanning measurements. From this good looking instrument we have some more pictures. 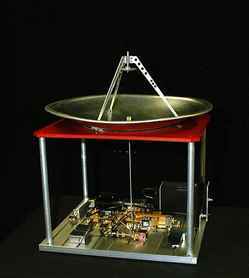 This small radiometer measures vertical temperature profiles. These two instruments, the 2 mm radar MIRACLE (middle) and the 22 channel microwave radiometer MICCY (left), were specially build for cloud studies. 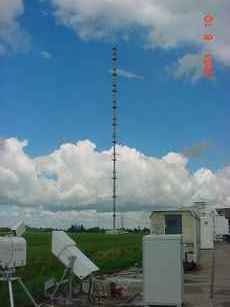 They have a narrow pencil beam and measure fast to be able to measure the highly variable cloud properties. And during the BBC campaign they will make simultaneous scanning measurements to capture the 3-dimenstional structure of clouds. To the right one can see the result of a azimuth scan with Miccy, made during the preparation phase. 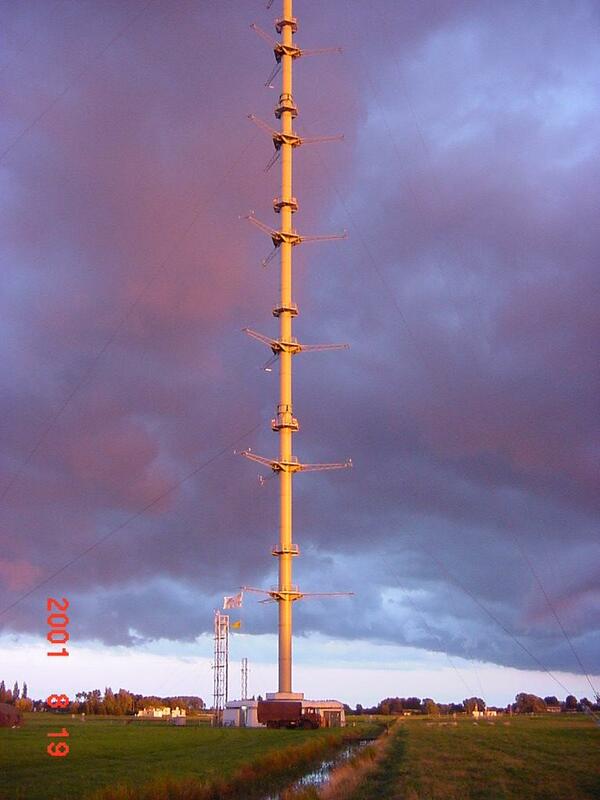 The lines are the total amount of cloud water measured in a column in a certain direction. The white line was measured two minutes before the green line. At the top left one can see new cloud coming in. At the top the clouds have moved a bit due to the wind. Instruments of course break down exactly during important campaigns. On such a friday night, one wishes that Cabauw was closer to Bonn. The russian contribution to the european CLIWA-NET project. 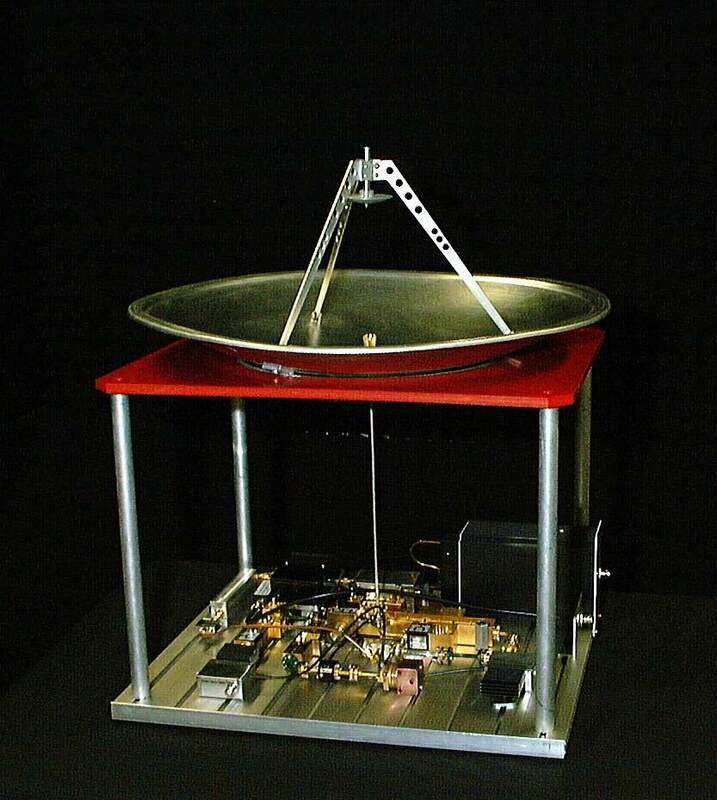 It would be fun if the comparison would show that this simple microwave radiometer made the best measurements. 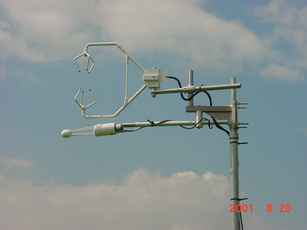 The radiometer of the UK Met office is supposed to look downward on a airplane. The plastic english garden box wasn't enough shelter for the Dutch sunny or rainy and windy weather. 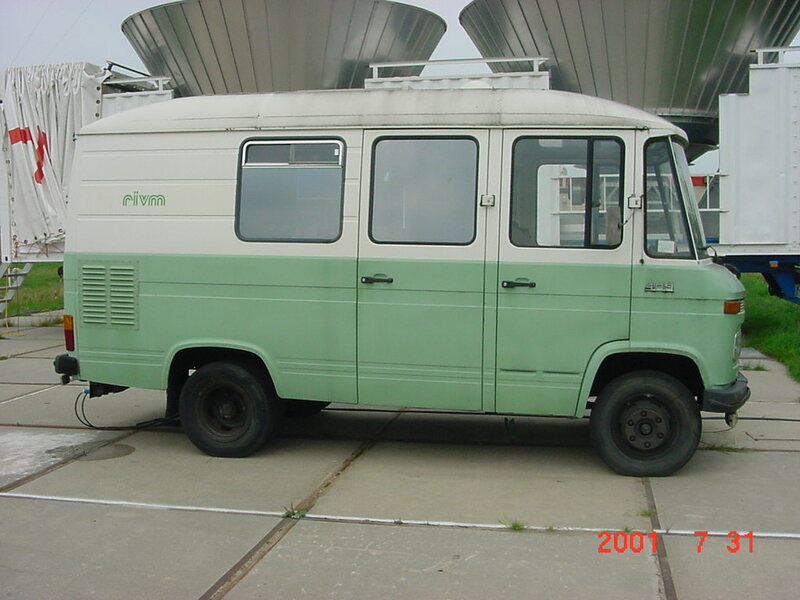 With an airco, some plastic and adhesive tape one can fix anything. 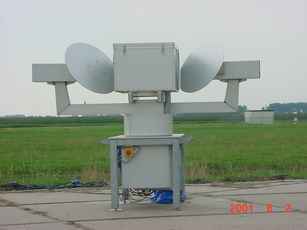 The GKSS 2 mm cloud radar, MIRACLE. 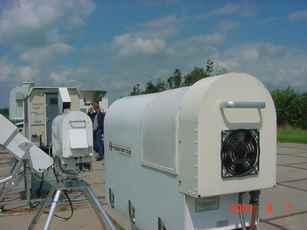 The KNMI, 8 mm cloud radar. 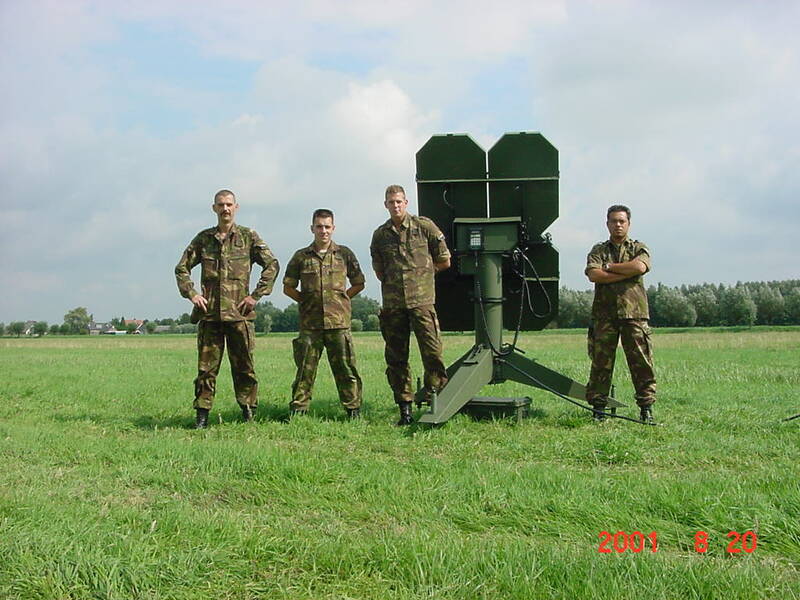 The light weight, compact and inexpensive, 2 mm radar from the IfT Leipzig, Powrad, that will be tested during BBC. 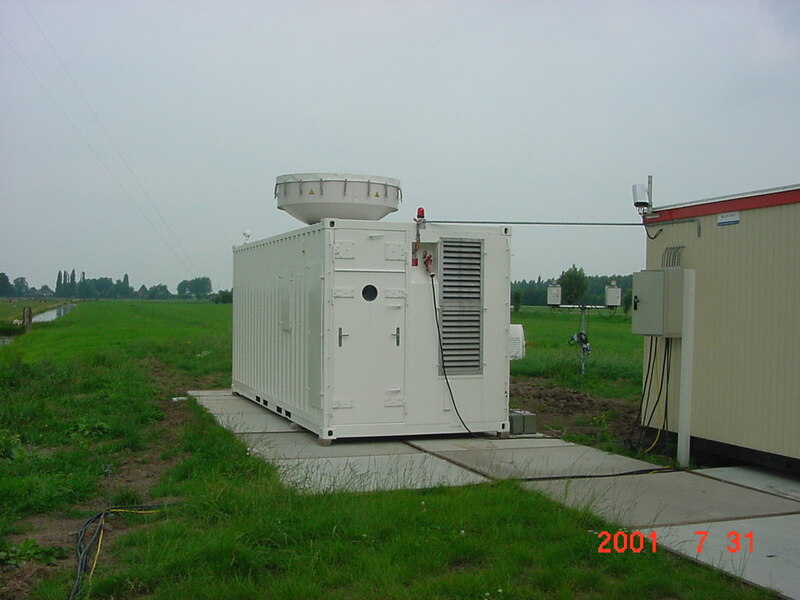 The Heiman infrared radiometer (KNMI) in the front measures heat radiation, to estimate the cloud base temperature and height. The lidar ceilometer in the back operates similar to a radar, but uses light pulses in stead of radio waves, to measure the cloud base height with very high accuracy. 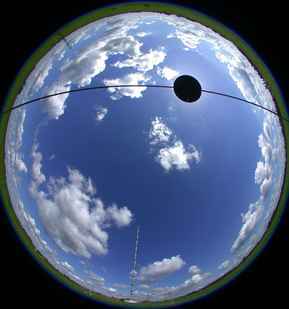 The university of Dresden makes beautiful cloud pictures with a digital camera and a fish eye lens. 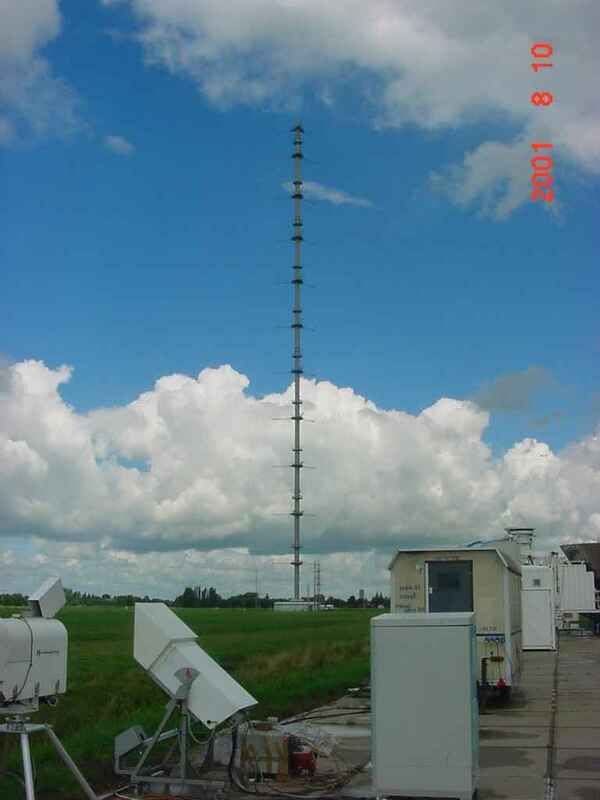 They are used to estimate the cloud cover. This cloud cover should be compared to the cloud cover measured by satellites with a much coarser spatial resolution. 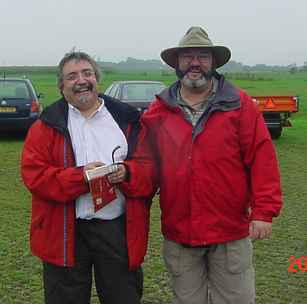 There is a large version of this picture (200 kb). 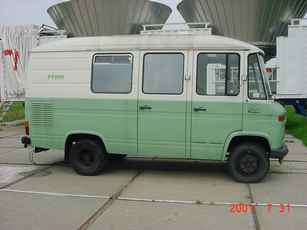 In this old van, the lidar of the RIVM, The Netherlands, is build in. This powerful backscatter lidar has been recently placed here as part of an effort to make an atmospheric observation site of Cabauw. Behind the van you see the two enormous antennas of the transportable radar TARA from the university of Delft, The Netherlands. For the same reason also this radar now has Cabauw as home base, when it is not needed for projects elsewhere. Of course this was just a small selection of the instruments, there are much more pictures. The Netherlands must have the most beautiful cloudscapes in the world. Especially in the evening. Some beautiful willows and storches. 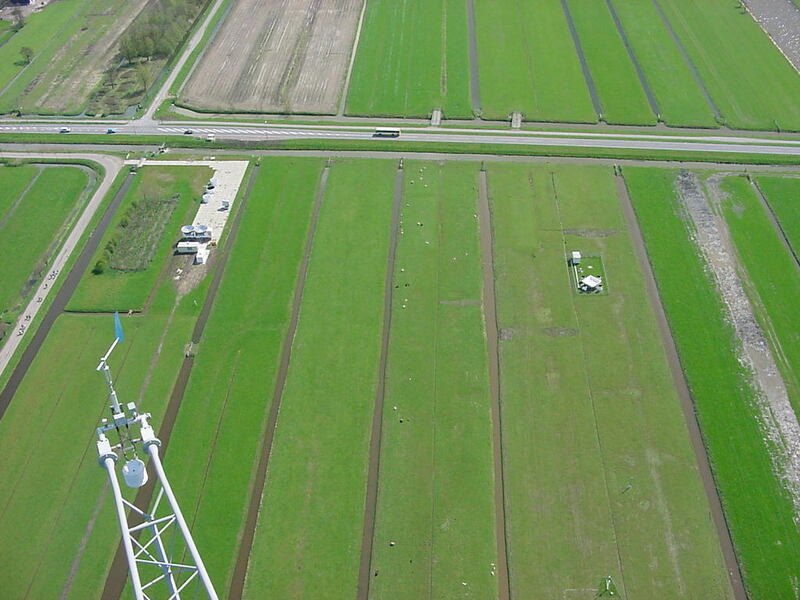 We are measuring in a beautiful surrounding, also called the green heart of The Netherlands. 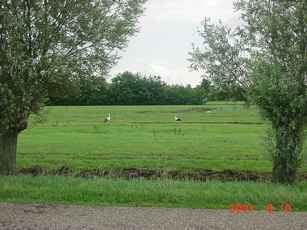 It is mainly agricultural land, especially milk cattle as the polder land is to wet for other uses. 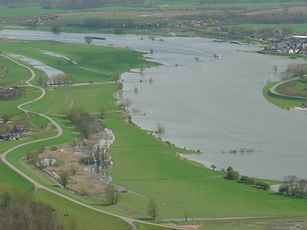 The site is close the river Lek, one of the arms of the river Rhine. Enjoy some more scenic views from the ground or from the tower. Inside the building at the base of the tower, Markus Quante (GKSS) and Andre van Lammeren (KNMI, project leader CLIWA-NET) are working. It must be fun, working at ESA-ESTEC, the research department of the European Space Agency (ESA) in Noordwijk at the Dutch coast. 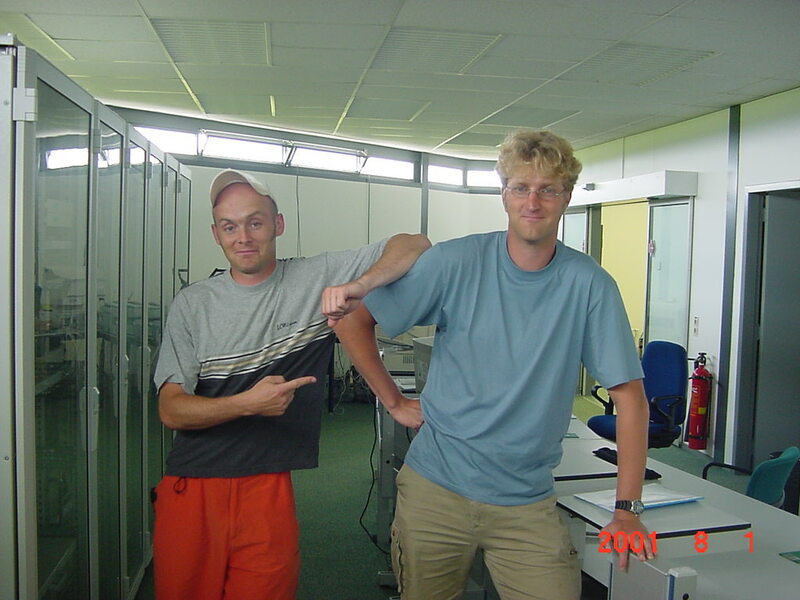 The blond swedish delegation from Chalmers University. The dutch army helps the experiment by guarding the terrain and by launching radiosondes. They had to practice launching sondes with their new system anyway. I guess the photographer really like the army or had a quiet day. 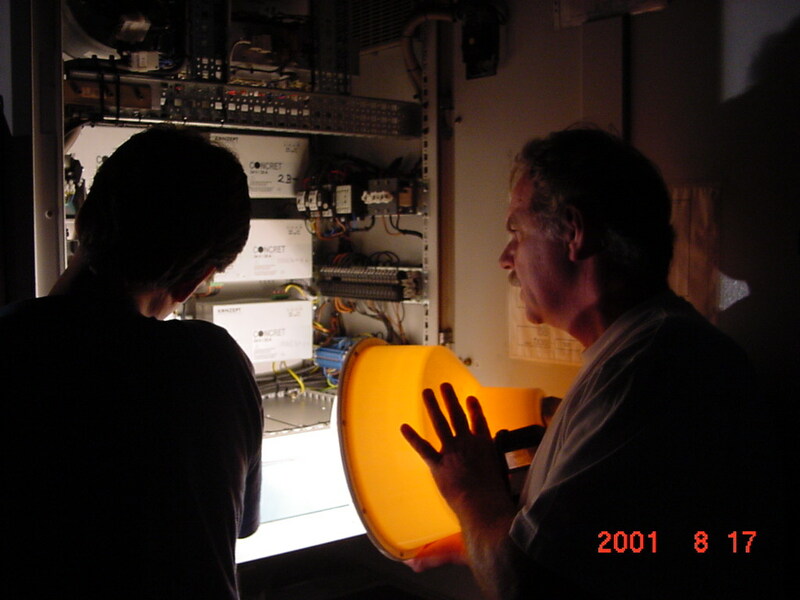 If you know some of the participants, you might want to look at these picture of scientists and technicians.